Construct an approximate 2,500-foot long, 10-foot wide multi-use path on one side of New Buffington Road. The proposed path would improve multi-modal safety and use by providing dedicated bicycle and pedestrian accommodations. 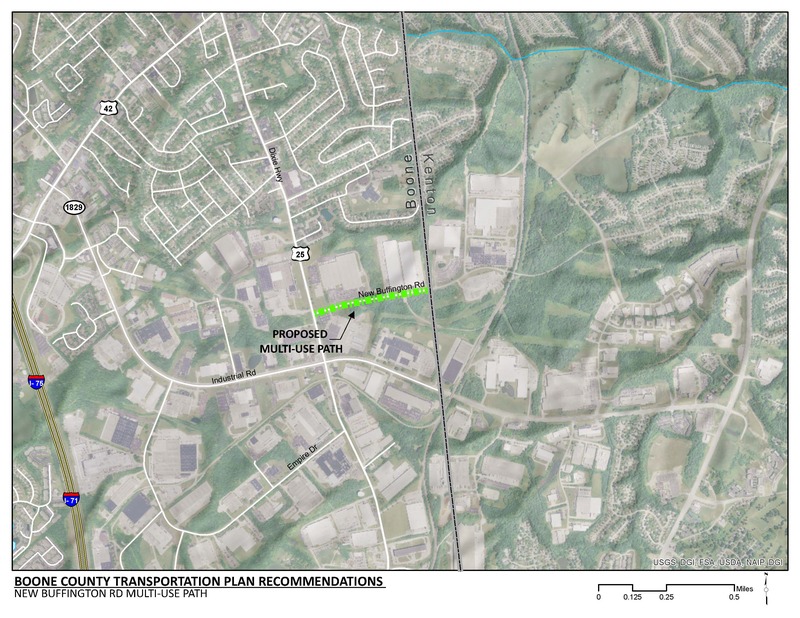 In conjunction with the multi-use path recommended in the Kenton County Transportation Plan, this improvement would provide a continuous multi-modal connection along New Buffington Road from US 25 (Dixie Highway) to the multi-use path on Garvey Avenue in Kenton County. In many locations along New Buffington Road, shoulders are minimal and steep drop-offs exist immediately outside the 10 foot travel lanes. Significant fill and culverts for proper water drainage will be needed for these areas. Due to right of way limitations and narrow lane widths, bike lanes on New Buffington Road are not recommended. This project will require acquisition of additional right of way. New Buffington Road is maintained by the City of Florence in Boone County and the City of Elsmere in Kenton County. Coordination between the agencies is necessary to implement and fund this project. Employment density ranges from 1,000 to 5,000 employees per square mile. New Buffington Road primarily serves industrial land uses. Concentrations of low income populations and disabled persons range in density from 20 percent to 40 percent in this area. The Northern Kentucky Planning Commission has identified the potential for 122 acres of new, industrial, 27 acres of multi-family residential, 68 acres of single-family residential and 30 acres of commercial within the vicinity of the project. During the five-year study period from 2012 through 2016, there were three pedestrian involved crashes along this section of roadway that resulted in two injuries. Immediately east of this recommendation, a multi-use path is also proposed along the Kenton County portion of New Buffington Road in the Kenton County Transportation Plan (OKI, 2014). TANK fixed Route 1 runs along US 25, the western terminus of this project. Although there are no dedicated bicycle facilities, the OKI Bike Route Guide recommends New Buffington Road as a preferred route.